A few kilometres away, at the Tsé Lowi site, conditions are no better. Some of the makeshift straw huts have been reinforced with plastic bags or sacks left over from past food distributions, but this provides scant protection from the rain. “It helps a little, but in most huts the water still seeps in,” says Mambo, who lives in Tsé Lowi. “Some people have no protection at all." 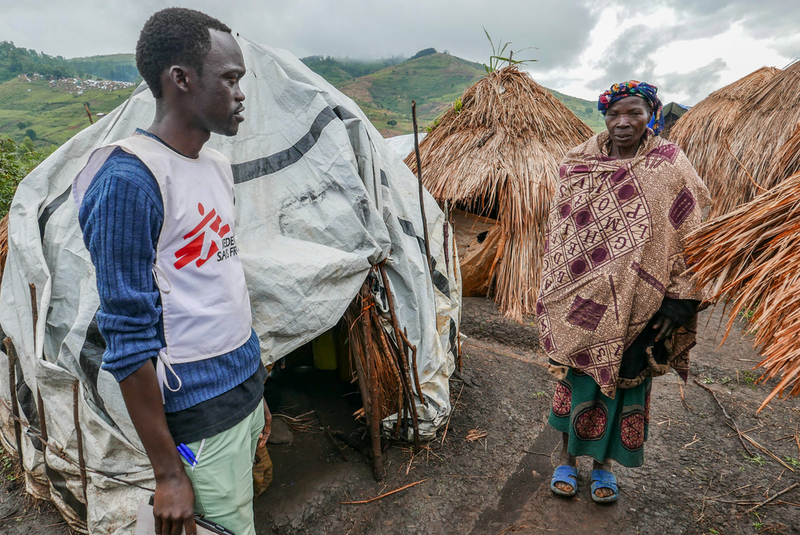 Patrick, health promoter for MSF, speaking with Kizayi Love, refugee in the GodoI camp. MSF has been in the region since April 2018, supporting 9 health centres, two general hospitals and has provided more than 57,000 free consultations. 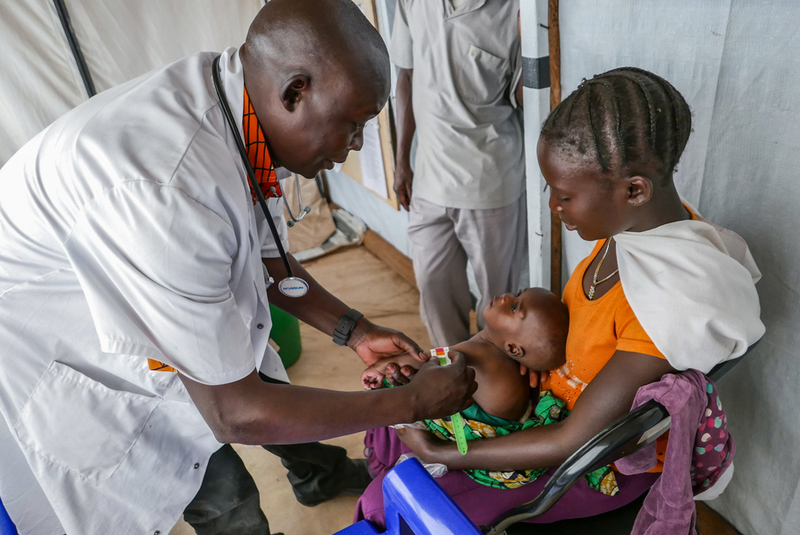 Despite this, mortality rates – particularly among children under five – were above normal in villages and sites for displaced people in Nizi, according to an MSF mortality survey conducted in October. They suffer mainly from malaria, diarrhoea, acute respiratory infections and malnutrition. “The environment in which displaced people live increases the risk and impact of diseases,” says MSF head of mission Dr Moussa Ousman. “Hygiene conditions are often deplorable: there are insufficient latrines, a lack of mosquito nets and people have no protection against the weather.” Malaria is endemic in this region, with a peak during the rainy season. With no way to make a living, the displaced people often struggle to feed their families. “As they are far from their fields, they are deprived of their usual livelihoods and have to fend for themselves to survive, which increases the risk of malnutrition among children,” says Dr Ousman. To tackle this situation, MSF has strengthened its medical response by training community members from 14 of the sites where displaced people are sheltering. They have been trained to identify the early stages of common diseases, and to provide medications to manage them. However, more remains to be done to support the displaced people in the Nizi region. “A medical intervention alone is not enough to have a real impact on mortality rates in the area. Displaced people’s basic needs should also be covered,” says Dr Ousman.